This is the view of a roundtable of national health and consumer leaders who have urged political leaders to recognise and act now on the many calls for primary health care reform that have been made in recent years. The growing burden of chronic disease, an ageing population, unsustainable funding and perverse incentives are among key factors making change imperative, the report finds. It has proposed the staged implementation over five years of a series of changes aimed at removing funding barriers to quality health care, moving away from largely fee-for-service medical care and enabling regionally, integrated health services through combined funding contributed by all levels of government. 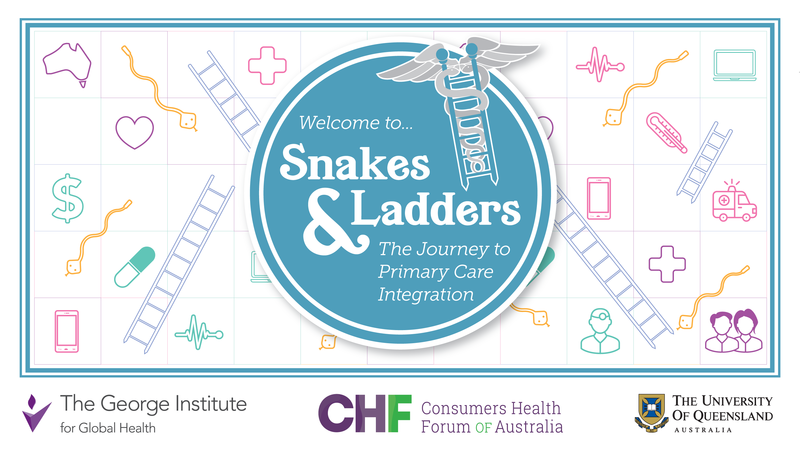 The report, Snakes and Ladders: The Journey to Primary Care Integration, results from an expert roundtable of consumers, clinicians, academics, government and private providers. The roundtable was convened by the Consumers Health Forum, The George Institute for Global Health and the University of Queensland MRI Centre for Health System Reform and Integration. Australia has begun significant reforms in establishing Primary Health Networks and trials of Health Care Homes but these remain overshadowed by public and media attention to hospitals and institutional care. We need accelerated action on primary care reform the report says. The report identifies 10 priorities for action including boosted funding for a revised model of the existing Health Care Homes program, which is aimed at providing better co-ordinated care for people with chronic and complex conditions. It also recommends strengthened Medicare funding and combined federal and state/territory funding for the existing Primary Health Networks and Local Hospital Networks to prioritise prevention and integrated services with mandated consumer participation and decision-making. A Consumer Enablement Portal to bring together and better promote access to a broad range of high quality consumer literacy, self-management, decision making tools and other information resources to empower consumers to participate in decisions about themselves, the services they receive and the systems they connect with. Recognition of the importance of professional collaboration and team-based care across all levels of health care, and funding models which promote joined-up models of health service delivery, including incentives for pharmacist advisers in general practice and specialist liaison staff to help patients reach the care they need. A demonstration project to empower consumers with complex chronic diseases to plan and manage their health by providing them with flexible funding packages – personalised budgets – providing for choice of services and providers. The establishment of a government-led National Centre for Health Care Innovation and Improvement to lead us into the future by testing and scaling up new ways of delivering care and paying for them as well as supporting the primary health care sector to excel in implementing new policy into services on the ground.